Kanonkop Hill has stunning views of the lagoon through the famous Knysna Heads and to the ocean. 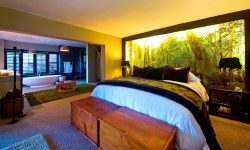 An elegant family run guest house in a peaceful indigenous forest 5 minutes from the centre of town. The grounds include a swimming pool, sundeck, terrace and bar. Kanonkop House also has WIFI, safe parking and great friendly service. 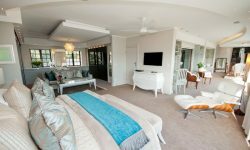 6 suites comprise of 2 Luxury Garden Suites which are spacious and individually decorated rooms opening to a large sundeck overlooking the swimming pool and garden. The Suites include bath and separate shower, couches, satellite television, music centre, coffee/tea facilities and complimentary bar. 3 Executive Lagoon view Suites are extra large with decorated rooms, views and private balconies with vistas of the indigenous forest and lagoon. 1 penthouse suite with incredible views from the room, bathroom, lounge and dressing areas as well as the two privet balconies. Offering all the comforts and conveniences of a modern home. Knysna Heights Villa is a luxurious three-level house situated on a ridge above the picturesque town of Knysna 5 minutes drive from Kanonkop House and three minutes drive from the town center with stunning views. The exclusive use villa has 3 en-suite bedrooms, 2 lounge areas, satellite TV, large plasma screen, and integrated music system and a fully equipped modern kitchen, dining room and swimming pool. 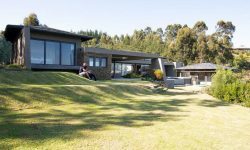 A 4 ensuite bed room Villa offering guests total privacy in the best surroundings with stunning views (over the Simola golf course, Outeniqua Mountains, Knysna River and Valley below), stunning entertainment areas (inside and out), two spacious lounges and a 16 meter rim flow pool. Guest can also enjoy the private “river boma” where you can enjoy complimentary canoes for a paddle up the river.